Be the first to share your favorite memory, photo or story of Alvina. This memorial page is dedicated for family, friends and future generations to celebrate the life of their loved one. Alvina Ann (Schadegg) Lousberg, 100, of Sterling passed away Tuesday, January 22, 2019 in Sterling. Visitation will be from 3:00 pm to 6:00 pm Friday, Feb. 1 at Tennant Funeral Home with Vigil and Rosary service following at 6:00 pm. Mass of Christian Burial will be at 9:00 am Saturday, Feb. 2 at St. Anthony’s Catholic Church with Father Michael Bodzioch celebrating. Interment will follow at Riverside Cemetery. Alvina was born on July 4, 1918, the 4th of 12 children on a farm west of St. Peter’s to Herman and Ida (Haag) Schadegg. 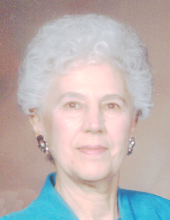 She was a member of St. Anthony’s Catholic Church and a former member of St. Peter’s Catholic Church. On June 4, 1940 she married Joe Lousberg. They lived on the farm at St. Peter’s until 1957 when they purchased the Bell Aire Motel in Sterling. Joe commuted to the farm and ranch until his death in 1992. Alvina retired in 1977 when they sold the motel. She enjoyed being with her family, was involved in church groups at St. Peter’s, and enjoyed traveling to many countries around the world. In her early years, she bowled and sponsored a team, she was a member of Zonta Club, and played in numerous Bridge Clubs. In her later years, she enjoyed playing cards, doing volunteer work at the nursing home, Birthright, and her church. She belonged to St. Benedict’s Circle, Catholic Daughter’s, Court St. Theresa, and Legion of Mary. Alvina is survived by her 3 daughters, Sandy (Rick) Schimschal, Bonnie (Denny) Volz, and Nancy (Dan) Klug; 5 grandchildren, Tanya, Jason, Aaron, Joel, Danielle; 11 great-grandchildren, Ashley Marie, Jessica, Mattingly, Raquel, Lily, Beth, Ella, Kinsey, Kamden, Kadence, Shelby; 2 great-great-grandchildren Elsie and Evelyn. Her beloved sister Eleanor Rigel and numerous nieces, nephews, and godchildren. She was preceded in death by her husband Joe; granddaughter Karin Schimschal; brothers Ernie, Clarence, and Shad; sisters Olive, Bernadine, Marie, Alice, Edna, Lorraine, and Arlene. Memorials may be made in her name to St. Anthony’s Catholic Church in care of Tennant Funeral Home, PO Box 1547, Sterling, CO 80751. To send flowers or a remembrance gift to the family of Alvina Ann Lousberg, please visit our Tribute Store. "Email Address" would like to share the life celebration of Alvina Ann Lousberg. Click on the "link" to go to share a favorite memory or leave a condolence message for the family.